For retirees who want to settle in the American Southwest active adult communities, Southern Utah offers spectacular scenery, beautiful homes, and plenty of outdoor recreation. 55+ and active lifestyle communities in the southern portion of Utah is home to the exciting St. George resort area, but the attractions do not end there. The whole region boasts campgrounds, scenic lakes, state parks, and much more. With mountains, deserts, and the Great Salt Lake, Utah has a diverse geography that experiences extreme temperatures in both the winter and summer months. Southern Utah active adult communities are located in a region that is largely a semi-arid climate. However it receives plenty of rain in the fall and spring, as well as snow in the winter. 55+ communities in Southern Utah enjoy hot summers, and even farther south the state can also have ample periods of rain during the warmer months. When it comes to visiting Southern Utah, most active adults head straight to the resorts in St. George. This beautiful area in Utah's southwest corner features a wide range of activities to entertain both locals and visitors alike. There are luxurious spas, challenging golf courses, historic shopping districts, educational museums and performing arts centers. Just a few of St. George's unique attractions include Coyote Gulch Art Village, Silver Reef Ghost Town and the Dinosaur Discovery Site at Johnson Farm. St. George is also home to some inviting active adult communities that are perfect for those who decide to retire in the area. SunRiver at St. George is an age-restricted golf community with a host of recreational and social activities. Those who prefer an all-age community might also find an ideal home in a luxurious golf community. In addition to their on-site amenities, St. George active adult communities are also located within easy access to a weekend getaway at the glittering Las Vegas Strip. Yet there is more to Southern Utah than the city of St. George. An hour east, active adults can enjoy plenty of outdoor recreations at Zion National Park. With towering rock structures and deep canyons, this scenic park is Southern Utah's top tourist attraction. Adventurous hikers will love exploring this national treasure, but anyone can enjoy the natural beauty with accessible trails like the paved Riverside Walk that meanders beside the Virgin River. Just a little ways north, the area around Cedar City also contains many natural wonders including the Cedar Breaks National Monument and the Parowan Gap. In the mountains above Cedar City, active adults can take in the beauty of attractions like Navajo Lake or Duck Creek Lake. Other Southern Utah hot spots include the Old Western towns of Kanab, Boulder's Anasazi State Park, and the Bryce Canyon National Park in Tropic. For a scenic retreat with plenty of natural beauty and outdoor recreations, Southern Utah certainly offers its own distinct flair. Whether choosing resort-style living in the fabulous St. George area or a more rustic home in the state's mountainous terrain, active adults are sure to find impressive destinations in Southern Utah. In 2013, unlike the entire state of Utah, the cost of living in St. George and its metropolitan area ranked lower than the national average. Essentially, Washington County was 91.6% of the national average and Cedar City was at 87.3%. 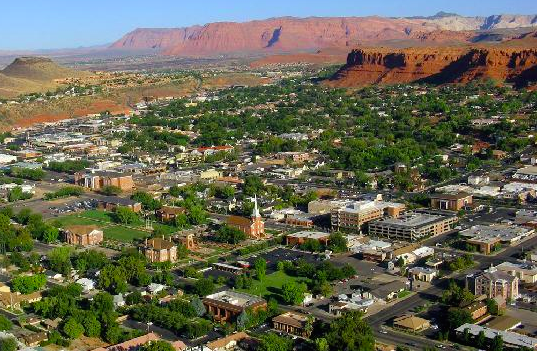 The city of St. George is a fast-growing city with tourism as a major industry. In terms of taxes, the state collects property taxes locally with tax breaks for homeowners and renters aged 66 and older. The state also provides a retirement income tax credit for income-eligible seniors. The state of Utah s residents have been ranked as having the fourth highest level of well-being in the nation. There are many top hospitals found throughout the state. Specifically in Southern Utah, most top medical facilities are located near the St. George metropolitan area. Dixie Regional Medical Center in St. George is a 245-bed hospital that has received many honors, awards, and has been praised for excellent heart care. Other hospitals in the region include San Juan Hospital in Monticello, Kane County Hospital in Kanab, Valley View Hospital in Cedar City, Moab Regional Hospital in Moab, Garfield Memorial Hospital in Panguitch, Castleview Hospital in Price, and Beaver Valley Hospital in Beaver.